We have original science fiction by Kat Howard (“The Universe, Sung in Stars”) and Jason Gurley (“Quiet Town”), along with SF reprints by Carolyn Ives Gilman (“The Invisible Hand Rolls the Dice”) and John Barnes (“The Birds and the Bees and the Gasoline Trees”). Plus, we have original fantasy by Joseph Allen Hill (“We’ll Be Together Forever”) and Dale Bailey (“The Ministry of the Eye”), and fantasy reprints by Sonya Taaffe (“A Wolf in Iceland is the Child of a Lie”) and Ken Liu (“The Ussuri Bear”). This month, we’re excited to share a feature interview with Chris Williams, the co-director of Disney’s Big Hero 6. We also have our latest book review column, an interview with this month’s fantastic cover artist, and of course interviews with all our authors. 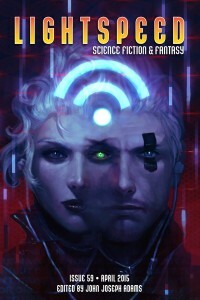 For our ebook readers, we also have a novella reprint from Kate Elliott (“On the Dying Winds of the Old Year and the Birthing Winds of the New”) and three novel excerpts, including The Rebirths of Tao, by Wesley Chu, The Grace of Kings, by Ken Liu, and a sponsored excerpt from Acheron Books, Lieutenant Arkham: Elves and Bullets by Alessio Lanterna (translated by Kate Mitchell).